Lately I’ve been pounding the table for investors to start looking at emerging markets — Latin America in particular. These countries are just hitting their investment “sweet spot” now. And it’s for the same reason that the growth of online companies exploded in the U.S. back in 2010 — faster internet connections, cheap but powerful devices and an explosion of compelling content on the web. PayPal’s recent $750 million strategic investment in MercadoLibre, the largest online retailer in Latin America. Recent data says it all. Among Latin America’s five largest countries, broadband internet penetration is only 50% — but growing at a 10% annual clip. Among mobile users in the region, only 27% have access to fast 4G connections. But that number’s also growing at a rapid pace. If you missed investing in the Facebooks, Apples, Amazons and Googles of the past 20 years in this country … you still have a chance to become a millionaire by looking at a region like Latin America that’s only just starting down the same road. Indeed, pretty much all of the companies I just mentioned are beating a path southward to latch on to the same rapid growth. Last year, Amazon opened new offices in Argentina, Brazil, Mexico, Chile and Colombia. Google invested $140 million in new data center construction there as well. Apple began opening its retail stores across the region in 2016. But for investors, the real money in the next decade will be made investing in the smaller companies targeting Latin America. They offer the most leverage as pure plays on the region’s growth. We have one in the Total Wealth Insider portfolio that’s already off to a strong start. It’s up 25% in less than two months, with multiples of growth still ahead. I’ll be adding more in the months ahead. 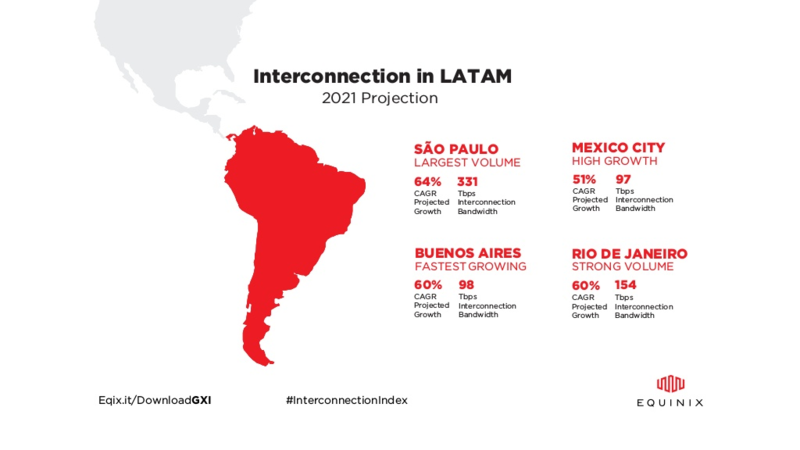 Look no further than data center construction and “data interconnections” for yet another example of Latin America’s internet growth. Equinix (a data center developer) recently said the region’s growth rate of data interconnections leads the world. According to the company, it expects Latin America’s links to the global cloud to grow at a 59% compounded annual growth rate between now and 2021. That’s huge. And it will be hugely profitable for investors who latch on to this trend now.